It is estimated that garage door openers in the average American household are operated approximately 1500 times each year. It takes a durable, high-quality garage door opener to withstand this amount of use, year after year. These five garage openers are some of the best by far, and offer performance that will last for years to come. This model is German-made and features a 3/4-horsepower motor. Instead of using belt drive or chain drive that many models use, the Direct Drive features a unique mobile motor system. This system features a single, mobile motor that crawls along a stationary change. The Direct Drive’s unique system makes it the reigning champ of our reviews. It is exceptionally quiet, but still offers power and can lift most heavy residential garage doors with ease. The Direct Drive is also reliable and easier to install than many other garage openers. It comes with an included garage door clicker, and a keypad entry is available for an additional cost. This model features a belt-drive motor. The Genie garage door opener stays true to its name, offering a much quieter operation than many of the other models in its class. It features a ¾-horsepower motor for powerful, heavy lifting. While it does not have as many features as some other models, the Genie is still user and pocketbook-friendly, offering quiet, powerful operation. Similarly to the Genie SilentMax, This Chamberlain garage door opener offers incredible belt-driven operation. This model is powerful, easy to install, and packed with additional features. The motor of the Chamberlain model offers ¾-horsepower for easy lifting of even the heaviest residential garage doors. It features battery back-up, My Q technology, an interior control panel, twin multifunctional garage door clicker remotes, and a keyless entry pad. The downside to the Chamberlain model is its price, as it is one of the more expensive garage door openers on the market. However, it offers the most features, surpassing even our Liftmaster garage door opener model. The Liftmaster 8550 uses a motor-belt drive system. This allows it to work with quietly and powerfully. This Liftmaster garage door opener is also energy-friendly, by consuming up to 75% less power than many of its competitors. In addition to its powerful, quiet, energy-friendly operation, this model comes packed full of features. These include My Q technology and a back-up battery, so you can get into your garage even during a power outage. Unfortunately, this model only comes with one garage door clicker. This Chamberlain model rounds up our list of the top 5 garage door openers. It is one of the best chain-driven models available. It features a ¾-horsepower motor that allows it to lift heavy doors easily. 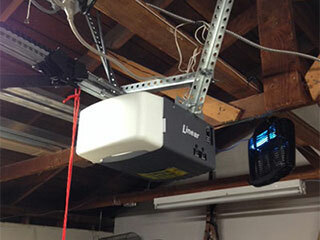 This Chamberlain garage door opener is exceptionally quiet for a chain-drive garage opener. While it is not as easy to install as the Direct Drive model, it still offers easy use, incredible power, and quiet operation. Another con of this model is the inclusion of only one garage door remote.